The materials for syllabication consist of two formats. The newest format is found in the Student Activity Center and Build Your Own. 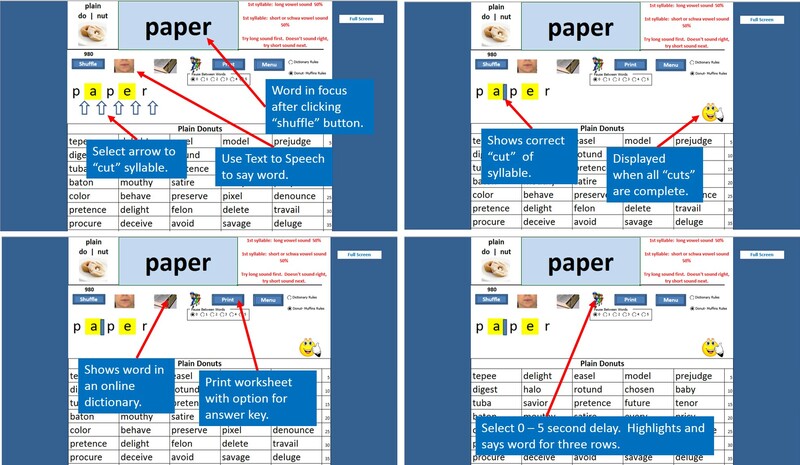 The format is very interactive and also uses TTS - Text to Speech to confirm the pronunciation of the word. A more graphical and interactive tool is a Microsoft Excel workbook. Using the table below, you should download and scan the file. Once downloaded, you can run the application from your own computer. You may want to add a shortcut to the desktop. You will also need to Enable Macros when opening the worksheet for the application to work. The following table will provide up to three versions of the tool. If by chance, a file becomes non-functional, just download another copy. An advanced feature of the materials is the use of Excel's Text to Speech (version 2003 or higher). Since each computer installs the program defaults differently, you can test your Excel's Text to Speech by creating a new document, click on the Tools menu, select Speech and select Show Text to Speech Toolbar. Your system may prompt you through several steps to activate it. You can still use many of the features of the materials if you can't get Text to Speech to work. 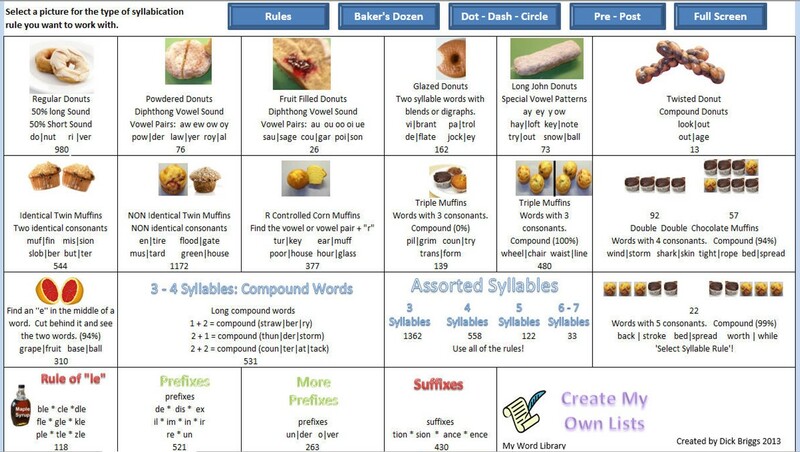 In reviewing Figure 1 below, you can see that the Menu tab allows you to select specific patterns to practice syllabication or "chunking" rules. Note that you can create your own wordlists to be displayed in Figure 2. Figure 2 illustrates the different options when working with the selected skill.